Background: Free radicals such as reactive oxygen and nitrogen species, generated in the body, play an important role in the fulfillment of various physiological functions but their imbalance in the body lead to cellular injury and various clinical disorders such as cancer, neurodegenaration, and inflammation. Objective: The objective of this study is to fight this problem, natural antioxidant from plants can be considered as possible protective agents against various diseases such as cancer which might also modify the redox microenvironment to reduce the genetic instability. This study was designed to evaluate the antioxidant and antiproliferative potential of Clerodendrum viscosum fractions against various carcinomas. 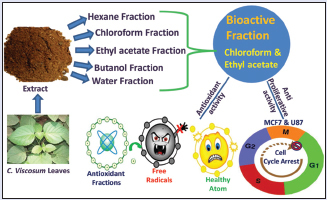 Materials and Methods: In this present study, 70% methanolic extract of C. viscosum leaves have been fractionated to obtain hexane, chloroform, ethyl acetate, butanol, and water fractions, which were tested for their antioxidant and anticancer properties. Results: It was observed that chloroform and ethyl acetate fractions showed good free radical scavenging properties as well as inhibited the proliferation of human lung cancer (A459), breast (MCF-7), and brain (U87) cells. Moreover, they arrested the cell cycle at G2/M phase of breast and brain cancer. These inhibitory effects were further confirmed by bromodeoxyuridine uptake imaging. Phytochemical investigations further indicate the presence of tannic acid, quercetin, ellagic caid, gallic acid, reserpine, and methyl gallate which might be the reason for these fractions' antioxidant and antiproliferative activities. Conclusion: Clerodendrum viscosum leaf chloroform and Clerodendrum viscosum leaf ethyl acetate fractions from C. viscosum showed good reactive oxygen species and reactive nitrogen species scavenging potential. Both the fractions arrested cell cycle at G2/M phase in MCF-7 and U87 cells which lead to induce apoptosis. Abbreviations used: CVLME: Clerodendrum viscosum leaf methanolic extract; CVLH: Clerodendrum viscosum leaf hexane; CVLC: Clerodendrum viscosum leaf chloroform; CVLE: Clerodendrum viscosum leaf ethyl acetate; CVLB: Clerodendrum viscosum leaf butanol; CVLW: Clerodendrum viscosum leaf water; BrdU: Bromodeoxyuridine; WST-1: Water soluble tetrazolium salt. Phytochemical investigations further indicate the presence of several bioactive principles present in them. Cancer is a collective term referring to a surfeited array of conditions distinguished by abnormal cellular behavior and uncontrolled proliferation. The biggest irony is that almost all mammalian tissue types and organs are prone to undergo oncogenic transformation due to reasons such as environmental influences, infectious agents, aging, and even genetic predisposition. Breast cancer is one of the greatest nightmares of the contemporary female population with record of highest rate of incidence (25.1%) and mortality (14.7%) among other cancers in women. Among all cancers in men worldwide, lung cancer scores the highest percentage (23.6%) of mortality. Unlike the above two, cancers of brain are relatively rare. Glioma happens to be the most common and highly malignant type of primary brain tumor in humans. Their fierce malignancy could be credited to high rates of cellular reproduction and the large network of supporting blood vessels. A plethora of synthetic drugs having varying efficacies, specificities as well as pathways of action exist, but their escalating costs and side effects limit their overall impact as therapeutics to great extents. The growing interest in natural medicine has instigated major laboratories to look into ancient/traditional medicinal plants and investigate the active principals. These natural remedies have the ability to manipulate cancer cells by altering their redox status , and cell cycle arrest to induce apoptosis, thereby reducing their genetic volatility and thus proving their worth in cancer treatment. Out of ~580 species of the genus, Clerodendrum that are widely distributed throughout tropical and subtropical regions of the world, several are popular for traditional medicine and have scientific evidences of being sources of antioxidants, anticancer,,, as well as hepatoprotective and wound healing agents.,Clerodendrum viscosum is a prominent medicinal plant in Ayurveda and used as a remedy against tumors, skin diseases, snake bite, scorpion sting, intestinal infections, and kidney dysfunctions since ages  it may be due to numerous phytochemicals which are present in the C. viscosum. Its value as an immensely good medicine has also been supported by our previous results where 70% methanolic extract of C. viscosum leaves (CVLME) was found to be rich in phenolic compounds with potent antioxidant activity. In the present study, we had separated the array of compounds from CVLME into five different fractions according to their relative polarities and studied their respective antioxidant activities as well as any possible manipulation in the cell cycle kinetics in lungs, breast, and brain cancer cell lines. 2,2'-azinobis-(3-ethylbenzothiazoline-6-sulfonic acid) (ABTS), cell proliferation reagent WST-1 and bromodeoxyuridine (BrdU) labeling and detection kit II were procured from Roche diagnostics, Germany. 6-hydroxy-2, 5, 7, 8-tetramethylchroman-2-carboxylic acid (Trolox) was obtained from Fluka, Buchs, Switzerland. Potassium persulfate (K2S2O8), 2-deoxy-2-ribose, ethylenediaminetetraacetic acid (EDTA), ascorbic acid, trichloroacetic acid, mannitol, nitro blue tetrazolium (NBT), reduced nicotinamide adenine dinucleotide (NADH), phenazine methosulfate (PMS), sodium nitroprusside, sulfanilamide, naphthylethylenediamine dihydrochloride (NED), L-histidine, lipoic acid, sodium pyruvate, quercetin and ferrozine were bought from Sisco Research Laboratories Pvt. Ltd, Mumbai, India. Hydrogen peroxide, potassium hexacyanoferrate, Folin-ciocalteu reagent, sodium carbonate, sodium hypochlorite, aluminum chloride, xylenol orange, butylated hydroxytoluene (BHT), and N, N-dimethyl-4-nitrosoaniline were purchased from Merck, Mumbai, India. 1,1-diphenyl-2-picrylhydrazyl (DPPH), Gallic acid, and curcumin were acquired from MP Biomedicals, France. Catalase, Ham's F-12, Dulbecco's Modified Eagle's Medium (DMEM), antibiotics, and Amphotericin-B were purchased from HiMedia Laboratories Pvt. Ltd, Mumbai, India. Evans blue was purchased from BDH, England. Diethylene-triamine-pentaacetic acid (DTPA) was supplied by Spectrochem Pvt. Ltd, Mumbai, India. Thiobarbituric acid (TBA) was purchased from Lobachemie, Mumbai, India. Fetal bovine serum was bought from HyClone Laboratories, Inc.(Logan, UT, USA). RNase A, 40, 60-diamidino-2 phenylindole, and Triton X-100 were purchased from MP Biomedicals (Illkirch Graffenstaden, France). Fresh leaves were collected from the campus of North Bengal University/the boondocks of Siliguri, West Bengal, India, in the month of June, 2015. Plant was authenticated by Taxonomist Prof. A. P. Das of Department of Botany, University of North Bengal and a voucher specimen bearing accession number of 9617, was stored at the Botany Department Herbarium, University of North Bengal, India. The leaves were processed and CVLME was prepared accordingly. An amount of 100 g of CVLME was reextracted successively with n-hexane, chloroform, ethyl acetate, n-butanol, and finally water to further fractionate the residing compounds into extracts of C. viscosum leaf hexane (CVLH), C. viscosum leaf chloroform (CVLC), C. viscosum leaf ethyl acetate (CVLE), C. viscosum leaf butanol (CVLB), and C. viscosum leaf water (CVLW), based on their relative polarities using the similar method. The supernatants from each solvent extraction were separately concentrated, lyophilized, and stored at −20°C until further use. The total antioxidant capacity of each fraction was estimated by ABTS-•+ radical cation decolorization assay using trolox as a standard and DPPH radical scavenging assay. The reducing powers of the fractions were assessed using a method previously described. The dose-dependent scavenging abilities of C. viscosum fractions against various reactive oxygen species (ROS), such as hydroxyl, hypochlorous radical, superoxide, and singlet oxygen were evaluated performing standard procedures. The reactive nitrogen species (RNS) scavenging activities were also determined for all samples using nitric oxide and peroxynitrite radical scavenging assays. The Fe 2+ chelating activities of the fractions were evaluated according to a previously described method. The Cell Lines purchased from National Centre for Cell Sciences (NCCS, Pune, India) were maintained in good laboratory conditions. Human cell lines for lung carcinoma (A549) was grown in F-12 Ham medium whereas, breast adenocarcinoma (MCF-7), glioblastoma (U87) and normal lung fibroblast (WI-38) cell lines were grown in DMEM. All the media supplemented with 10% (v/v) FBS, 100 U/mL penicillin G, 50 μg/mL gentamycin sulfate, 100 μg/mL streptomycin, and 2.5 μg/mL amphotericin-B. All cells were maintained at 37°C in a humidified atmosphere containing 5% CO2. Cell viability was quantified according to a method described previously  using the WST-1 Cell Proliferation Reagent, Roche diagnostics. WST-1, a water-soluble tetrazolium salt [2-(4-Iodophenyl)-3-(4-nitrophenyl)-5-(2,4-disulfophenyl)-2H-tetrazolium, monosodium salt] is reduced to formazan by glycolytic reduction of NAD(P)H production by viable cells. Briefly, 1 × 104 cells/well was treated with various doses (0-200 μg/mL in case of A549, MCF-7, WI-38 and 0-300 μg/mL in case of U87) of each fraction for 48 h in 96-well culture plates. After that, 10 μl of WST-1 cell proliferation reagent was added to each well followed by an incubation of 3-4 h at 37°C. Absorbance of formazan was measured at 460 nm using a microplate ELISA reader MULTISKAN EX (Thermo Electron Corporation, USA). Cell cycle analysis was performed according to a method described previously. 1 × 106 cells were treated with bioactive fractions dose-dependently (0–200 μg/mL in case of A549 and MCF-7 and 0–300 μg/mL in case of U87) for 48 h in 12-well culture plates. Since the doubling time of A549 is 27 h  and for both MCF-7, U87 are 24 h, the time-dependent study using the highest dose was also performed. 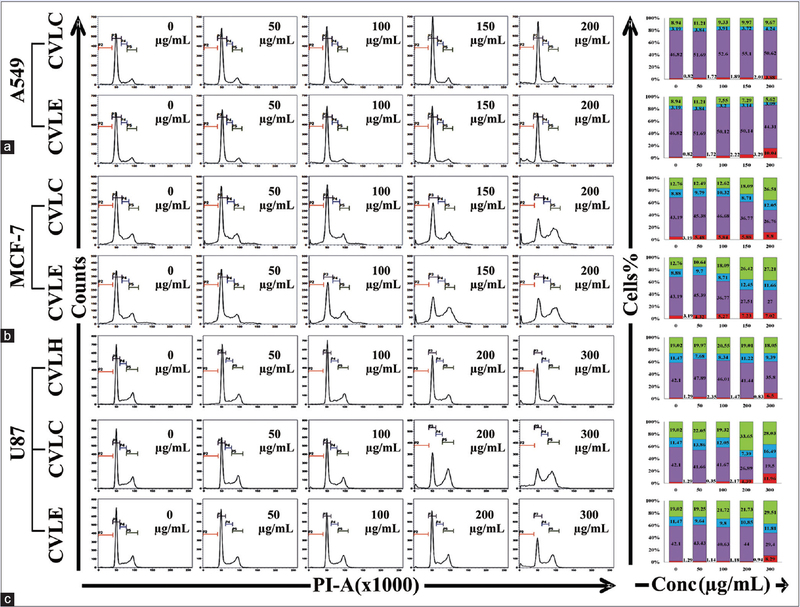 Same number of cells was treated with bioactive fractions CVLC and CVLE (200 μg/mL for A549 and MCF-7 and 300 μg/mL for U87 cells) for different time intervals (0–48 h). Post treatment cellular DNA was stained with propidium iodide, and cell phase distribution was determined on FACS Verse (Becton Dickinson) equipped with 488 nm (Blue), 405 nm (Violet), and 640 nm (Red) solid state laser light using FACSuite software Version 1.0.3.2942. A total 10,000 events were acquired and data analysis was done using the same software. A histogram of DNA content (X-axis, red fluorescence) versus count (Y-axis) was plotted. A549, MCF-7, and U-87 cells were plated for 24 h and treated with effective doses of bioactive fractions for 12 h and further labeled with BrdU for observing apoptotic effects and arrest in treated cells following the kit's protocol. Post treatment cells incorporate BrdU into their DNA when incubated for short time (1 h). The cells were then fixed and stained with anti-BrdU monoclonal antibody and reincubated with anti-mouse-Ig-alkaline phosphatase. The healthy cells would incorporate BrdU while the fraction-treated apoptotic arrested cells would not repair DNA or replicate, hence, no BrdU incorporation. Finally, stained cells were imaged in ×200 magnification using Leica microscope. The qualitative and quantitative analysis of resident phytochemicals such as alkaloids, carbohydrates, flavonoids, glycosides, phenols, saponins, and tannins in all the fractions were carried out using standard methods, as described previously.,, For high-performance liquid chromatography (HPLC) analyses of the fractions, stock solutions were prepared in mobile phase for the sample and standards including gallic acid, reserpine, catechin, tannic acid, and quercetin and filtered using 0.45 μm polytetrafluoroethylene filter (Millipore, Billerica, MA, USA). An HPLC-Prominence System RF10AXL (Shimadzu Corp., Kyoto, Japan) equipped with degasser (DGU-20A5), quaternary pump (LC-20AT), auto-sampler (SIL-20A), and detectors of reflective index (RID-10A), fluorescence (RF-10AXL), and diode array (SPD-M20A) was used to perform the analysis. Gradient elution of the samples was done with consecutive mobile phases of acetonitrile and 0.5 mM ammonium acetate in water, at a flow rate of 1 mL/min for 70 min through the column (ZIC ®-HILIC) at 25°C temperature. The detection was carried out at 254 nm. The injection volume was 20 μl, and the sample and standards were analyzed in triplicates. Cytotoxicity data were reported as the mean ± standard deviation (SD) of six measurements, and cell cycle analysis data were reported as the mean ± SD of 3 measurements. The statistical analysis was performed by KyPlot version 2.0 beta 15 (32 bit). The IC50 values were calculated by the formula, Y = 100 × A1/(X + A1) where A1 = IC50, Y = response (Y = 100% when X = 0), X = inhibitory concentration. The IC50 values were compared by paired “t-test.” P ≤ 0.05 was considered statistically significant. CVLH, CVLC, CVLE, CVLB, and CVLW fractions were evaluated for antioxidant activity. Among all the fractions, CVLB showed the highest total antioxidant compared with standard drug Trolox [Figure 1]a and [Figure 1]b and DPPH radical scavenging activities [Figure 1]c while CVLE proved to be the most efficient source of reducing agents where its activity was similar to that of the standard ascorbic acid at higher doses [Figure 1]d. CVLB showed the highest total antioxidant (TEAC value - 0.446 ± 0.004) and DPPH radical scavenging activities (IC50 - 25.79 ± 0.17) while CVLE proved to be the most efficient reducing agents with IC50 near to standard ascorbic acid. Hydroxyl radical scavenging assay exhibits the ability of extract to inhibit hydroxyl radical mediated deoxyribose degradation; we found that all fractions showed excellent dose-dependent activity toward hydroxyl radical scavenging, even better than standard mannitol [Figure 1]e. All solvent fractions except hexane fraction exhibited good dose-dependent HOCL scavenging activities better than standard ascorbic acid [Figure 1]f with CVLE being the best scavenger of HOCl [Table 1]. Superoxide radicals generated from the PMS-NADH coupling can be measured by their ability to reduce NBT. CVLB and CVLW showed excellent dose-dependent superoxide anion scavenging activities [Figure 1]g. Fractions of C. viscosum did not show any substantial activity against singlet oxygen insult [Figure 1]h.
On the other hand, RNS such as nitric oxide (NO-•) and peroxynitrite (ONOO −) are equally responsible for causing protonated damages. 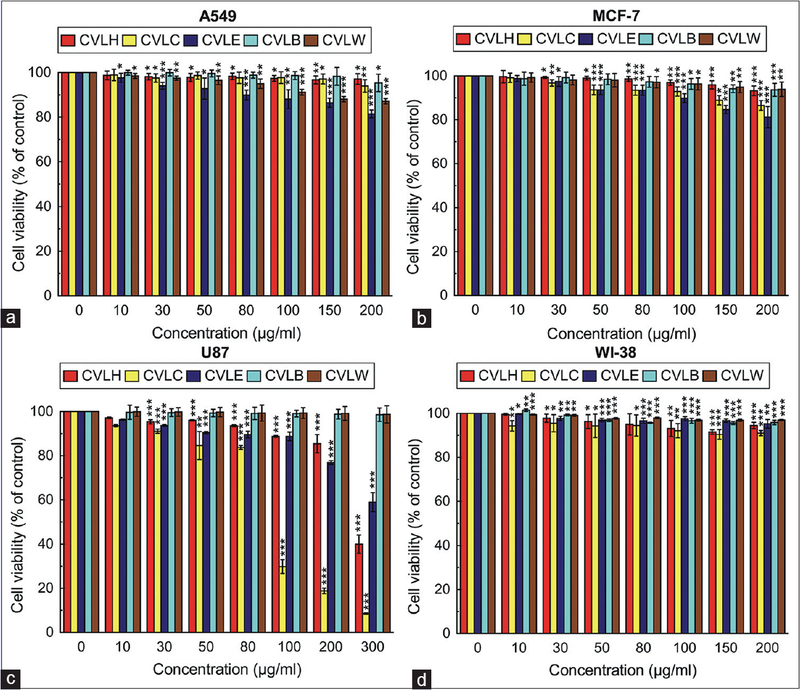 The CVLW and CVLE displayed good dose-dependent activities of scavenging NO-• [Figure 1]i. CVLH and CVLE showed moderate dose-dependent activities in scavenging ONOO − [Figure 1]j. The aqueous fraction displayed the best activity in inhibiting the formation of ferrozine-Fe 2+ complex, indicating its best iron chelation activity among the other fractions [Figure 1]k. EDTA acts as standard iron chelating drug [Figure 1]l. IC50 values of all C. viscosum fractions for antioxidant assay have been reflected in [Table 1]. The cytotoxic effects of the fractions on A549, MCF-7, and U87 cells as well as normal fibroblast cells (WI-38) were evaluated by WST-1 cell proliferation kit, and the respective IC50 values were calculated from dose-dependent response studies after 48 h treatment of various fractions [Table 2]. It was found that CVLC showed excellent antiproliferative activity against U87 cells [Figure 2]c. CVLE on the other hand was responsible to cause the highest rates of mortality in A549 [Figure 2]a and MCF-7 [Figure 2]b, among all fractions. CVLB and CVLW failed to show cytotoxicity against any of the cancerous cells; hence, they were not proceeded with for further studies. Moreover, none of the fractions exhibited any toxicity toward normal fibroblast cells, WI-38 [Figure 2]d.
The effect of each fraction on the cell cycle of A549, MCF-7, and U87 was analyzed using flow cytometry. It was observed that CVLC successfully augmented cell cycle arrest at the G2/M phase in MCF-7 and U87 cells, along with a gradual increase in apoptosis. In addition, the ethyl acetate fraction seems to induce G2/M arrest in MCF-7 cells, starting at 100 μg/mL with a final 2 fold increase in sub G1 and G2/M populations at 150 and 200 μg/mL [Figure 3]b. Similar effect was observed in U87 cells on treatment with 200 and 300 μg/mL of CVLC and CVLE [Figure 3]c. The cell cycle of A549 cell line was mostly unaffected on treatment with the fractions except for slight apoptotic behavior of cells on treatment with CVLE at the highest dose [Figure 3]a. CVLH, on the other hand, caused no significant change in the cell cycle distribution of any of the cell lines except for U87 at the highest dose of 300 μg/mL, showing mild apoptosis [Figure 3]c.
Incubation of these cells with the fractions for increasing time intervals was also found to exert similar effects in a time-dependent manner. A549 cells when treated with 200 μg/mL of CVLC showed negligible change while at the same dose, CVLE-induced gradual apoptosis at 24 h which increased to 10.79% at 48 h [Figure 4]a. [Figure 4]b shows gradual induction of G2/M arrest in MCF-7 cells on treatment with the highest doses of CVLC and CVLE fractions. After 24 and 48 h incubation, a decline in the G1 cell population was evident, whereas, sub G1 and G2/M phases showed higher cell populations. This transition corroborated with previous dose-dependent cell cycle analyses. U87 cells on treatment with 300 μg/mL of CVLC showed gradual decrease in G1 population and an increase in G2/M population. Similar effect was observed on treatment with the same dose of CVLE in a time-dependent manner [Figure 4]c.
The bioactive fractions were tested for their activity in altering the cell cycle progression of cancer cells; their effects were imaged and represented in [Figure 5] by anti-BrdU antibody staining. In untreated A549 cells, BrdU incorporation is highly evident from their nuclear stain and healthy morphology denoting normal growth. CVLE (200 μg/mL) showed round-shaped shrunken shriveled morphology of the partially stained cells while CVLC did not show much effect on A549. Untreated MCF-7 cells showed incorporation of BrdU into replicating healthy nuclei (dark black patch inside the cells). 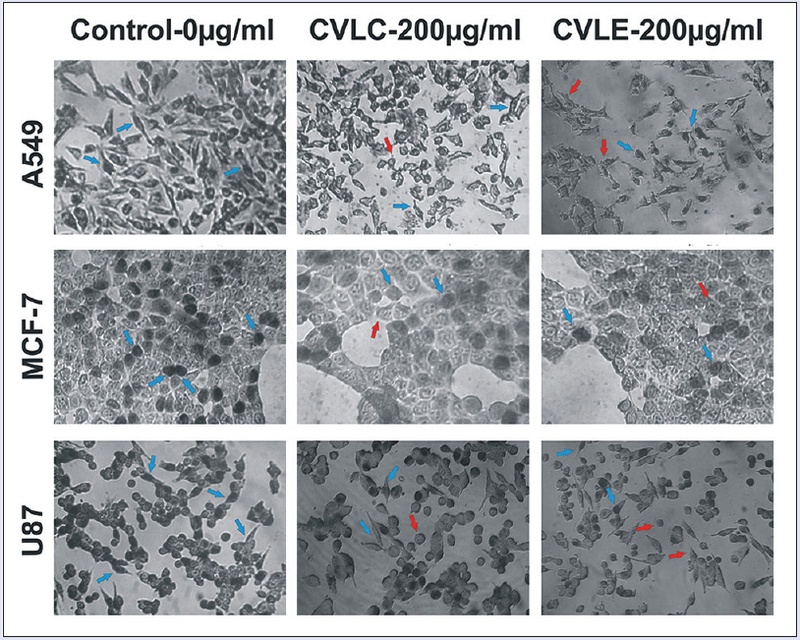 After treatment with highest dose of CVLC and CVLE, BrdU was partially incorporated into some nuclei indicating the inhibition in the proliferation of cells. A similar effect was also observed when U87 cells were treated with CVLC and CVLE (200 μg/mL). Quantification of some of the vital group of compounds revealed that the chloroform and ethyl acetate fractions along with butanol were rich in alkaloids and phenolic compounds [Table 3]. CVLE and CVLC showed highest flavonoid and total tannins content, respectively. The chloroform and ethyl acetate fractions of C. viscosum leaves indicated the presence of tannic acid, quercetin, gallic acid, and rutin [Figure 6]b and [Figure 6]c. In addition to the above, reserpine, ellagic acid, and methyl gallate were also evidenced in CVLE, CVLB, and CVLW [Figure 6]c, [Figure 6]d and [Figure 6]e. The hexane fraction which is supposed to contain fat type compounds, displayed evidence of tannic acid, and rutin only [Figure 6]a.
ROS and RNS have vital roles in the initiation and/or promotion of DNA damage, activation of pro-carcinogens, and in manipulation of the innate antioxidant defense system. Our previous reports have shown that 70% CVLME scavenges most of the free radicals in a dose-dependent manner with substantial efficiencies. As an extension of the above work, we tried to investigate which fraction(s) is mostly responsible for the scavenging activity in case of each radical. It was observed that polar fractions of ethyl acetate and butanol showed excellent antioxidant activities. Hydroxyl radical is probably the most common and notorious ROS in a biological system; it is also able to cause unnecessary damage to biomolecules easily. All the fractions showed very good activity in scavenging hydroxyl radicals in vitro as compared to standard mannitol. Hypochlorous acid (HOCl) generated at the sites of inflammation by activated monocytes and neutrophils. When all the fractions were tested against HOCl, it was observed that all the fractions except hexane showed excellent scavenging ability toward HOCL. Similarly, the superoxide anion is a harmful oxidizing agent, chiefly providing substrates for the Haber-Weiss reaction leading to the formation of HO-•. CVLB and CVLW fractions showed excellent superoxide radical scavenging ability indicating that the compounds responsible for the scavenging activities of the crude extract  were highly polar. Along with various ROS, RNS such as nitric oxide and peroxynitrite are equally responsible for causing protonated damages. CVLW and CVLE showed good nitric oxide scavenging activity, whereas CVLH and CVLE acted as good peroxynitrite scavenger. Being an imperative element in the human body, iron shares important tasks in numerous biochemical processes but on excess accumulation in liver, iron leads to oxidative damage of biomolecules leading to hemochromatosis, L-thalassemia, ischemic heart disease, and cancer. In this study, it was found that aqueous fractions showed good iron chelation activity as compared to other fractions. To investigate the antiproliferative effects of the antioxidant fractions, the WST-1 cell proliferation assay was performed which demonstrated that CVLC inhibited the growth of U87 cells while CVLE displayed excellent inhibition of A549 and MCF 7 cells dose dependently. CVLH, however, showed slight toxicity against U87 cells but possessed negligible effect on the other carcinomas. However, more polar fractions of butanol and water showed negligible cytotoxicities on all the cancer cells. Moreover none of the fractions showed toxicity against the normal fibroblast cells (WI-38). Cells complete their life cycle in multiple well-controlled phases regulated by variety of checkpoints. Aberration in the behavior of G2/M checkpoint arrest is associated with enhanced apoptosis. The flow cytometric analysis showed that CVLC remarkably induced cell cycle arrest in MCF-7 and U87 at G2/M phase both in dose- and time-dependent manner. Both chloroform and ethyl acetate fractions increased G2/M population by more than 2-fold at highest concentration indicating G2/M phase arrest in MCF-7 cells while decreasing G1 population and causing slight apoptosis. However, in case of brain cancer U87 cells, CVLC induced higher apoptotic effect at 300 μg/mL, along with G2/M arrest, similar effect was noticed in U87 when treated with CVLE. CVLH showed no significant effect on cell cycle of any carcinoma cells. Hence, it was not tested in time dependent cell cycle experiment. The cell cycle of A549 cells was mostly unaffected on treatment with the fractions except for slight apoptotic behavior of cells on treatment with ethyl acetate fraction, both at highest dose of 200 μg/mL and longest time of treatment of 48 h. In addition, only CVLE showed little effect on A549 cells and rest of the fractions has no activity. Cells showing a uniform BrdU label in its nucleus were denoted as replicating healthy cells while cells with scattered BrdU foci and limited area of BrdU uptake in nucleus were differentiated as DNA repairing cells, normal to post G2/M arrest. Hence, arrested cells remain 90% BrdU negative since DNA repairing mechanisms lead to discrete BrdU foci, difficult, and intangible toward light microscopy. After treatment with CVLC and CVLE, cells were treated with BrdU-labeled medium for an hour while cell repair machinery targets to revive the cellular DNA repair mechanism. Partial incorporation of BrdU was observed in MCF-7 and U87 cells after the treatment with CVLC and CVLE fractions, indicative of inhibited cell proliferation. These observations corroborated with cell cycle analysis which showed G2/M arrest. Thus, BrdU incorporation was observed to a minimal extent in arrested cells as seen in the images of unstained rounded cells. Further, studies are required to conclude clearly the arrest and apoptotic states with investigation into ATR, p53, p21, and H2AX phosphorylation. The fractions indicated the presence of various phytochemicals, estimated by various phytochemical analyses. Phenolic compounds perform key roles as antioxidants and metal chelators as well as signaling agents in biological pathways. By virtue of diverse medicinal values, alkaloids contribute as important scaffolds in therapeutic drugs against ailments such as cancer and many more. The HPLC chromatograms obtained from the fractions showed that CVLC, CVLE, and CVLB were rich source of alkaloids, flavonoids, and phenolic compounds showing the presence of gallic acid, methyl gallate, tannic acid, ellagic acid, quercetin, and reserpine. Gallic acid has been reported to show antioxidant activity  along with anticancer effect against lung and brain cancer cells., Similarly, methyl gallate has been reported for its cell growth inhibition and apoptosis in glioma cells. Tannic acid and ellagic acid , also have antioxidant effects , along with reported antiproliferation against cancers such as lung carcinoma, breast cancer, and brain glioblastoma. Quercetin on the other hand also has prominent effect on lung  and breast  cancer along with free radical scavenging  activities. The presence of such probable compounds in the C. viscosum chloroform and ethyl acetate fractions may hence play cumulative roles in imparting antioxidant and anticancer effects, thus establishing phytochemical content-function relationship through various mechanisms such as cell cycle arrest and apoptosis. The chloroform and ethyl acetate fractions of C. viscosum leaves showed better antioxidant and anti-proliferative activities. CVLC and CVLE exhibited good ROS and RNS scavenging activities. These fractions also did not affect the viability of normal fibroblast WI-38 cells. Bioactive fractions CVLC and CVLE arrested breast cancer (MCF-7) and brain cancer (U87) cells at G2/M phase and induced apoptosis. These results were further confirmed by BrdU uptake imaging. Hence, our findings suggest C. viscosum leaf fractions (CVLC and CVLE) as potent antioxidant and anticancer extracts and their bioactivities are the result of the probable identified compounds. In future, more research needs to be carried out to isolate bioactive compounds from these fractions which could be better and safer antioxidant and anticancer drugs. Anil Khushalrao Shendge and Dipankar Chaudhuri are grateful to Council of Scientific and Industrial Research, Government of India for providing the fellowship. Tapasree Basu is grateful to University Grants Commission for her fellowship. The authors are thankful to Dr. Nikhil Baban Ghate for critically reviewing this manuscript and Mr. Ranjit Kumar Das, Mr. Pradip Kumar Mallik, and Mr. Ranjan Dutta for their technical assistance. World Health Organization GLOBOCAN: Estimated Cancer Incidence, Mortality and Prevalence Worldwide in 2012; 2012. Available from: http://www.globocan.iarc.fr/Pages/fact_sheets_population.aspx. [Last accessed on 2017 Mar 01]. Gurney JG, Kadan-Lottick N. Brain and other central nervous system tumors: Rates, trends, and epidemiology. Curr Opin Oncol 2001;13:160-6. Schafer FQ, Buettner GR. Redox environment of the cell as viewed through the redox state of the glutathione disulfide/glutathione couple. Free Radic Biol Med 2001;30:1191-212. Su D, Cheng Y, Liu M, Liu D, Cui H, Zhang B, et al. Comparision of piceid and resveratrol in antioxidation and antiproliferation activities in vitro . PLoS One 2013;8:e54505. 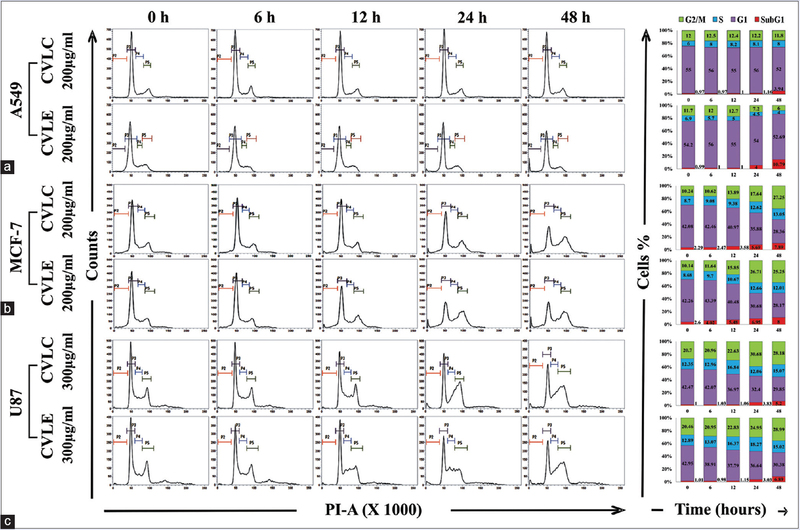 Chaudhuri D, Ghate NB, Singh SS, Mandal N. Methyl gallate isolated from Spondias pinnata exhibits anticancer activity against human glioblastoma by induction of apoptosis and sustained extracellular signal-regulated kinase 1/2 activation. Pharmacogn Mag 2015;11:269-76. Shebaby WN, El-Sibai M, Smith KB, Karam MC, Mroueh M, Daher CF. The antioxidant and anticancer effects of wild carrot oil extract. Phytother Res 2013;27:737-44. Nandi S, Lyndem LM. Clerodendrum viscosum : Traditional uses, pharmacological activities and phytochemical constituents. Nat Prod Res 2016;30:497-506. Das A, Chaudhuri D, Ghate NB, Chatterjee A, Mandal N. Comparative assessment of phytochemicals and antioxidant potential of methanolic and aqueous extracts of Clerodendrum colebrookianum Walp. leaf from North-East India. Int J Pharm Pharm Sci 2013;5:420-7. Singh N, Katiyar PK, Singh R. Anticancer activity of leaves of Clerodendron Serratum Spreng. Am J PharmTech Res 2012;2:452-61. Shrivastava N, Patel T. Clerodendrum and healthcare: An overview. Med Aromat Plant Sci Biotechnol 2007;1:142-50. Sannigrahi S, Mazumder UK, Pal D, Mishra SL. Hepatoprotective potential of methanol extract of Clerodendrum infortunatum Linn. against CCl4 induced hepatotoxicity in rats. Pharmacogn Mag 2009;5:3949. Gbedema SY, Emelia K, Francis A, Kofi A, Eric W. Wound healing properties and kill kinetics of Clerodendron splendens G. Don, a Ghanaian wound healing plant. Pharmacognosy Res 2010;2:63-8. 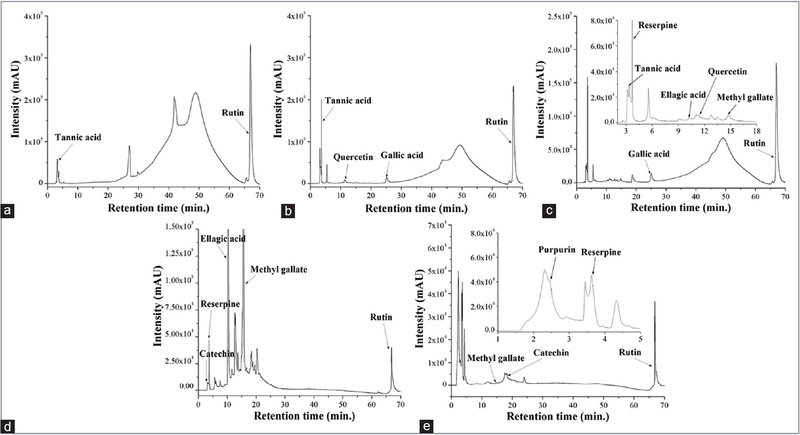 Ghosh G, Panda P, Rath M, Pal A, Sharma T, Das D. GC-MS analysis of bioactive compounds in the methanol extract of Clerodendrum viscosum leaves. Pharmacognosy Res 2015;7:110-3. Dey P, Chaudhuri D, Tamang S, Chaudhuri TK, Mandal N. In vitro antioxidant and free radical scavenging potential of Clerodendrum viscosum . Int J Pharm Bio Sci 2012;3:454-71. Das A, Chaudhuri D, Mandal N, Chatterjee A. Study of antioxidant and reactive oxygen species scavenging activity of the edible tuber of “greater yam” (Dioscorea alata L.) from North-East India. Asian J Pharm Clin Res 2012;5:74-84. Hazra B, Biswas S, Mandal N. Antioxidant and free radical scavenging activity of Spondias pinnata . BMC Complement Altern Med 2008;8:63. Ghate NB, Hazra B, Sarkar R, Mandal N. Heartwood extract of Acacia catechu induces apoptosis in human breast carcinoma by altering bax/bcl-2 ratio. Pharmacogn Mag 2014;10:27-33. Ishimaya M, Shiga M, Sasamoto K, Mizoguchi M. A new sulfonated tetrazolium salt that produces a highly water-soluble formazan dye. Chem Pharm Bull 1993;41:1118-22. Limame R, Wouters A, Pauwels B, Fransen E, Peeters M, Lardon F, et al. 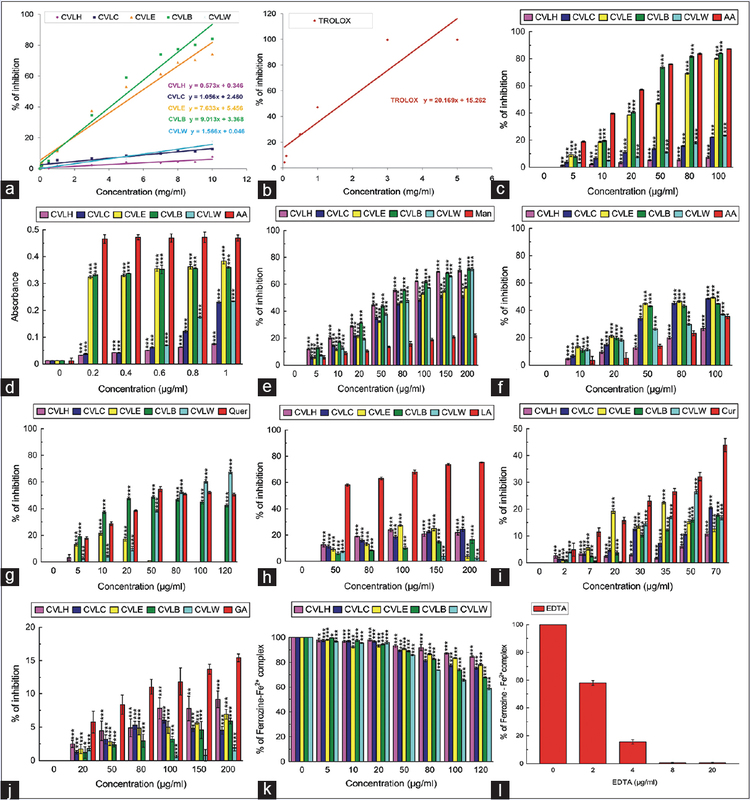 Comparative analysis of dynamic cell viability, migration and invasion assessments by novel real-time technology and classic endpoint assays. PLoS One 2012;7:e46536. Sutherland RL, Hall RE, Taylor IW. Cell proliferation kinetics of MCF-7 human mammary carcinoma cells in culture and effects of Tamoxifen on exponentially growing and plateau-phase cells. Cancer Res 1983;43:3998-4006. Kato TA, Tsuda A, Uesaka M, Fujimori A, Kamada T, Tsujii H, et al. In vitro characterization of cells derived from chordoma cell line U-CH1 following treatment with x-rays, heavy ions and chemotherapeutic drugs. Radiat Oncol 2011;6:116. Ghate NB, Chaudhuri D, Sarkar R, Sajem AL, Panja S, Rout J, et al. An antioxidant extract of tropical lichen, Parmotrema reticulatum , induces cell cycle arrest and apoptosis in breast carcinoma cell line MCF-7. PLoS One 2013;8:e82293. Harborne JB, Baxter H. Phytochemical Dictionary: A Handbook of Bioactive Compounds from Plants. 2nd ed. London: Taylor and Francis; 1995. Kokate CK, Purohit AP, Gokhale SB. Testbook of Pharmacognosy. Pune: Nirali Prakashan; 2003. Ghate NB, Chaudhuri D, Mandal N. In vitro assessment of Tinospora cordifolia stem for its antioxidant, free radical scavenging and DNA protective potentials. Int J Pharm Bio Sci 2013;4:373-88. Benov L. How superoxide radical damages the cell. Protoplasma 2001;217:33-6. Das A, Chaudhuri D, Ghate NB, Panja S, Chatterjee A, Mandal N. Protective effect of Clerodendrum colebrookianum leaves against iron-induced oxidative stress and hepatotoxicity in Swiss albino mice. Indian J Exp Biol 2015;53:281-91. Sherr CJ. The Pezcoller lecture: cancer cell cycles revisited. Cancer Res 2000;60:3689-95. DiPaola RS. To arrest or not to G(2)-M Cell-cycle arrest. Clin Cancer Res 2002;8:3311-4. Kao GD, McKenna WG, Yen TJ. Detection of repair activity during the DNA damage-induced G2 delay in human cancer cells. Oncogene 2001;20:3486-96. Fragkos M, Jurvansuu J, Beard P. H2AX is required for cell cycle arrest via the p53/p21 pathway. Mol Cell Biol 2009;29:2828-40. Tripoli E, Giammanco M, Tabacchi G, Di Majo D, Giammanco S, La Guardia M. The phenolic compounds of olive oil: Structure, biological activity and beneficial effects on human health. Nutr Res Rev 2005;18:98-112. Kittakoop P, Mahidol C, Ruchirawat S. Alkaloids as important scaffolds in therapeutic drugs for the treatments of cancer, tuberculosis, and smoking cessation. Curr Top Med Chem 2014;14:239-52. Yen G, Duh P, Tsai H. Antioxidant and pro-oxidant properties of ascorbic acid and gallic acid. Food Chem 2002;79:307-13. Lu Y, Jiang F, Jiang H, Wu K, Zheng X, Cai Y, et al. Gallic acid suppresses cell viability, proliferation, invasion and angiogenesis in human glioma cells. Eur J Pharmacol 2010;641:102-7. Yong WK, Ho YF, Malek SN. Xanthohumol induces apoptosis and S phase cell cycle arrest in A549 non-small cell lung cancer cells. Pharmacogn Mag 2015;11 Suppl 2:S275-83. Perchellet JP, Gali HU, Perchellet EM, Klish DS, Armbrust AD. Antitumor-promoting activities of tannic acid, ellagic acid, and several gallic acid derivatives in mouse skin. Basic Life Sci 1992;59:783-801. Narayanan BA, Geoffroy O, Willingham MC, Re GG, Nixon DW. P53/p21(WAF1/CIP1) expression and its possible role in G1 arrest and apoptosis in ellagic acid treated cancer cells. Cancer Lett 1999;136:215-21. Gülçin I, Huyut Z, Mahfuz E, Hassan YA. Radical scavenging and antioxidant activity of tannic acid. Arabian J Chem 2010;3:43-53. Booth BW, Inskeep BD, Shah H, Park JP, Hay EJ, Burg KJ. Tannic acid preferentially targets estrogen receptor-positive breast cancer. Int J Breast Cancer 2013;2013:369609. Nguyen TT, Tran E, Nguyen TH, Do PT, Huynh TH, Huynh H. The role of activated MEK-ERK pathway in quercetin-induced growth inhibition and apoptosis in A549 lung cancer cells. Carcinogenesis 2004;25:647-59. Coşkun O, Kanter M, Armutçu F, çetin K, Kaybolmaz B, Yazgan Ö. Protective effects of quercetin, a flavonoid antioxidant, in absolute ethanol-induced acut gastric ulcer. Eur J Gen Med 2004;1:37-42.